Tabernanthe iboga or simply iboga is a perennial rainforest shrub and psychedelic, native to western Central Africa. Iboga stimulates the central nervous system when taken in small doses and induces hallucinations in larger doses. In parts of Africa where the plant grows, the bark of the root is chewed for various pharmacological or ritualistic purposes. Ibogaine, the active alkaloid, is also used to treat substance abuse disorders and depression. 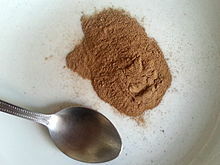 A small amount of ibogaine, along with precursors of ibogaine, are found in Voacanga africana. Normally growing to a height of 2 m, T. iboga may eventually grow into a small tree up to 10 m tall, given the right conditions. It has small green leaves. Its flowers are white and pink, while the fruit can be either an elongated oval shape, or a round spherical shape, both having an orange color. Its yellow-colored roots contain a number of indole alkaloids, most notably ibogaine, which is found in the highest concentration in the root-bark. The root material, bitter in taste, causes anesthetic sensation in the mouth as well as systemic numbness to the skin. Bark of Tabernanthe iboga. According to users in Kinshasa, Democratic Republic of Congo, only 3 grams of shredded bark are required for a single dosage, or cup. The Iboga tree is the central pillar of the Bwiti spiritual practice in West-Central Africa, mainly Gabon, Cameroon and the Republic of the Congo, which uses the alkaloid-containing roots of the plant in a number of ceremonies. Iboga is taken in massive doses by initiates of this spiritual practice, and on a more regular basis is eaten in smaller doses in connection with rituals and tribal dances, which are usually performed at night. Bwitists have been subject to persecution by Catholic missionaries, who to this day are thoroughly opposed to the growing spiritual practice of Bwiti. Léon M’ba, before becoming the first President of Gabon in 1960, defended the Bwiti religion and the use of iboga in French colonial courts. On June 6, 2000, the Council of Ministers of the Republic of Gabon declared Tabernanthe iboga to be a national treasure. In lower doses Iboga has a stimulant effect and is used to maintain alertness while hunting. Iboga extracts, as well as the purified alkaloid ibogaine, have attracted attention because of their purported ability to reverse addiction to recreational drugs such as alcohol and opiates. Anecdotal reports assert that administration of ibogaine reduces craving for opiates and cocaine for extended periods of time. Ibogaine is a k-opioid agonist which may be the reason it reduces opiate withdrawal symptoms. While some published data suggests that iboga derivatives attenuate drug- and ethanol-induced behaviors in rodents, as well as humans. Ibogaine is classified as a schedule 1 controlled substance in the United States, and is not approved there for addiction treatment (or any other therapeutic use) because of its hallucinogenic and cardiovascular side effects, as well as the absence of safety and efficacy data in human subjects. In most other countries it remains unregulated and unlicensed. Independent ibogaine treatment clinics have emerged in Mexico, Canada, the Netherlands, South Africa, and New Zealand, all operating in what has been described as a “legal gray area”. Covert, illegal neighborhood clinics are also known to exist in the United States, despite active DEA surveillance. Addiction specialists warn that the treatment of drug dependence with ibogaine in non-medical settings, without expert supervision and unaccompanied by appropriate psychosocial care, can be dangerous — and, in approximately one case in 300, potentially fatal. Iboga is outlawed or restricted in Belgium, Poland, Denmark, Croatia, France, Sweden, and Switzerland. In the United States Iboga is classified by the Controlled Substances Act on the list of schedule I drugs. Non-profit organization Föreningen för hollistisk missbruksvård (ibogain.se) is trying to convince the Swedish government to start up clinical investigations of its anti-addictive properties, loosen up the prohibition law against ibogaine, and allow the creation of treatment facilities in Sweden. Exportation of iboga from Gabon is illegal since the passage of a 1994 cultural protection law. While little data is available on the exploitation and existing habitat of the iboga plant, the destructive effects of harvesting and slow growth could have already severely damaged the wild iboga population. In this French-language film, Gilbert Kelner documents modern Bwiti practices and Babongo perspectives on iboga. Odisea broadcast a Spanish-dubbed version titled Los hombres de la madera (“The Men of the Wood”). Directed by Ben Deloenen. A 34-year-old heroin addict undergoes ibogaine treatment with Dr Martin Polanco at the Ibogaine Association, a clinic in Rosarito Mexico. Deloenen interviews people formerly addicted to heroin, cocaine, and methamphetamine, who share their perspectives about ibogaine treatment. In Gabon, a Babongo woman receives iboga root for her depressive malaise. Deloenen visually contrasts this Western, clinical use of ibogaine with the Bwiti use of iboga root bark, but emphasizes the Western context. In this episode (series 1, episode 4) of the English documentary series Tribe, presenter Bruce Parry ingests iboga during his time with the Babongo. BBC 2 aired the episode on 25 January 2005. ^ a b McGown, Jay (2006). “Out of Africa: Mysteries of Access and Benefit Sharing” (PDF). Edmonds Institute. Archived from the original (PDF) on December 24, 2012. Retrieved July 28, 2014. ^ a b c Hunter, Aina (December 13, 2005). “Busted for Iboga”. Village Voice. Retrieved July 28, 2014. ^ “Arrêté du 12 mars 2007 modifiant l’arrêté du 22 février 1990 fixant la liste des substances classées comme stupéfiants” [Decree of 12 March 2007 amending the Decree of 22 February 1990 establishing the list of substances classified as narcotics]. admi.net (in French). 2007. Retrieved July 28, 2014. ^ “Loi n°2/94 du 23 décembre 1994 portant sur la protection des biens culturels” [Law No. 2/94 of 23 December 1994 on the protection of cultural property]. African Archaeology (in French). 2008. Retrieved July 28, 2014. ^ Tonye, Mahop Marcelin et. al (March 2000). “State of Knowledge Study on Tabernanthe Iboga Baillon: A Report For The Central African Regional Program For The Environment” (PDF). Limbe Botanic Garden. Retrieved July 28, 2014. Pharmacodynamics and Therapeutic Applications of Iboga and Ibogaine, Robert Goutarel, Otto Gollnholfer and Roger Sillans (Originally published in Psychedelic Monographs and Essays, 6:70-111 (1993). Tabernanthe iboga in West African plants – A Photo Guide. African Spirit Medicine Patrick Haize writes in Vision Magazine about his experience getting treated at Crossroads Ibogaine Treatment Center in Rosarito, Mexico.